There was a time, not so long ago, when our family measured life by days…minutes…and breaths taken. Each day was a blessing, and we recognized the true miracles we were witnessing. On Nov. 12, 2013, our daughters Paige and Harper came into this world fighting. They arrived too soon at 25 weeks and 5 days gestation and both weighing in at just over a pound each. And, so on that day, our NICU (neonatal intensive care unit) journey began. We had our ups and downs. We celebrated minor and major successes, and each day was one closer to our hearts feeling complete. 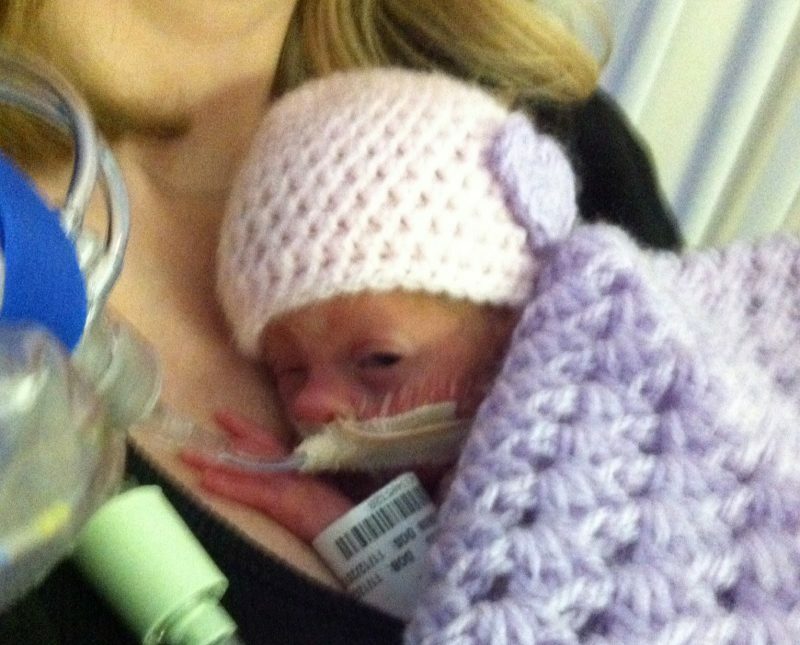 Those days spent in the NICU were some of the scariest times in our lives, but also some of the most peaceful as well. All of the beeps, the alarms, and the constant shuffle (which could sometimes come across as sensory overload), became a normal part of our day. 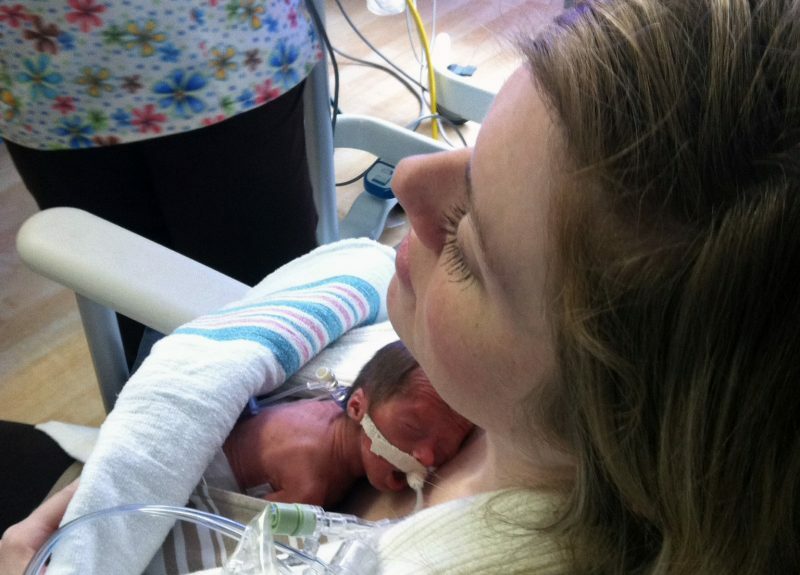 We quickly turned into make-shift NICU staff members, picking up on the lingo and maneuvering around what seemed like miles of cords attached to the fragile bodies of our micro preemies. Our world was turned upside down but one thing remained constant—the love that filled and surrounded our little family was strong. From the moment Paige and Harper were born, I just knew they were destined for great things. I never lost sight that there was an unknown, underlying reason for their arrival 3 months early. I knew they would fight as hard as they could, and that one day they would be enjoying life to its fullest potential. For 96 days, these precious little gals learned how to open their eyes, how to breathe, and how to eat on their own. And they did it beautifully, we couldn’t have been more proud! In the heat of it, a single day felt like 100 days and getting them home felt so far away. I would daydream about what life would be like for each of the girls and our family. I had hopes and dreams for them, and I prayed they would get to experience all that life has to offer. 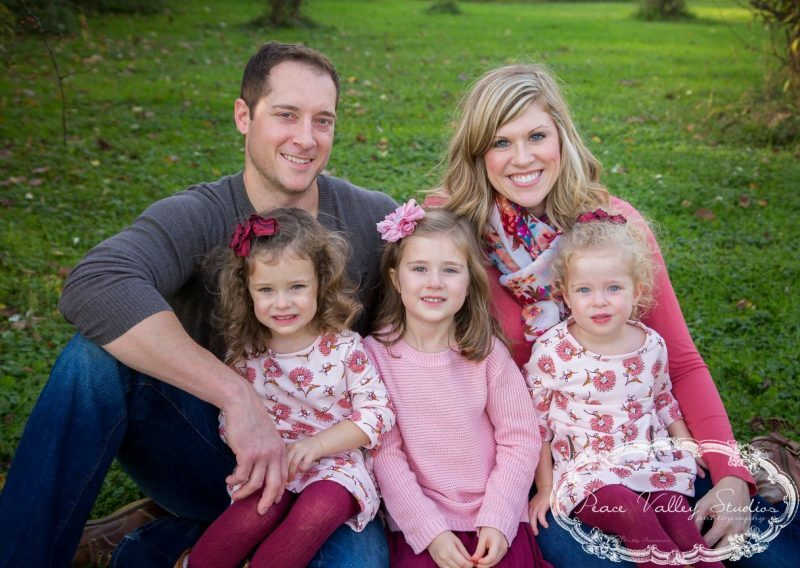 Over the past 3 ½ years Paige and Harper have developed, grown and excelled. They are a far cry from the micro preemies they once were. They love to play dress up, have books read to them, run around outside and all other things that 3 year olds love to do. The bond they have with one another is something truly remarkable and they both adore their big sister, Aubrey. I look at them in amazement each and every day! So, as they started a new journey in their lives – preschool – it has given me much time to reflect on just how far they have truly come. 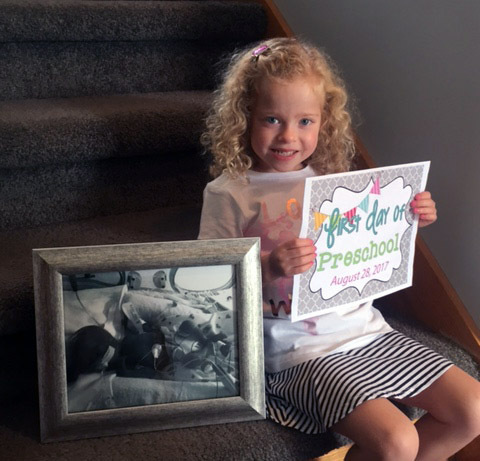 Harper sits next to her NICU photo just before heading to preschool for the first time. We celebrate the bright little girls they are today, but we also celebrate the journey it took to get where we are as a family. Mommy, Daddy, and Big Sister are so proud of their fight and determination. 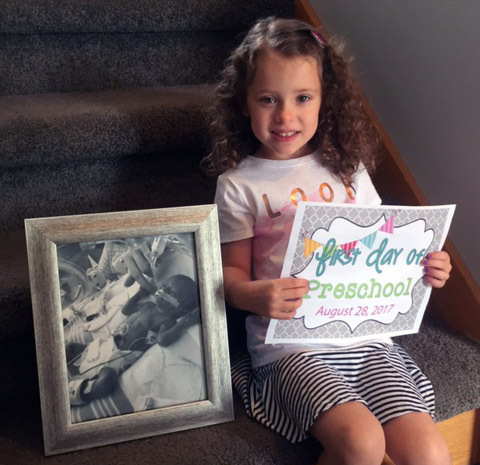 We will continue to dream big for their futures, but for right now we will celebrate this new milestone as they went from preemies to preschool. Paige was ready to pose with her picture too. Look out world: the Oltmann twins are off and running!